The Full Moon of August 29th has perfected and the moon is now waning. Sellers have an advantage over buyers, Virgo planets increase their influence, and Sun Opposite Neptune on August 31st clearing away what the Full Moon did not. If you are a “creative,” then you might can develop some good work (poetry, music, photos, video, etc. ), but for everyone else this day is best spent as “down time.” For most of the week and moving forward, school is in session (both literally and metaphorically), and the time has now come to start working in a manner that is diligent and persistent. While we do still have important moments of creativity, what wins now is doing what it takes to get the job done. A square key on that date on August 31st will also provide parting lessons about our recent experiences as we move into September and more fully into the school year. Pay attention. You will need what you learn. While remnants of August, and our recent Leo experiences, still exist, after the Full Moon of August 29th perfects we unofficially start September and for many the school year. This might be your last weekend to “play” for some time. Regarding that project (or projects) we recommended you work on this week? If you ran into a “wall” where you could not “get things done,” then maybe it is time to cut your losses and expend your efforts elsewhere. We are moving into a new phase in many ways. We hope you noted, and seized, the opportunity you saw Wednesday. “Things” become more intense on Thursday, August 27th, and by Friday, August 28th, both a hard rectangle is present and Sun Sesquiquadrate Uranus perfects. You can accomplish much at that time as long you make certain you do not lose your temper and do something inappropriate due to a rash decision. (Again, Europe and UK (and some people in the U.S.) will feel this on August 27th.) Even if you engage in a dispute, be focused and disciplined in your efforts; avoid impulsive decisions. This is a better day for follow through and “getting things done” before the Full Moon of August 29th perfects than it is for starting something new. And, if you run into a “wall” where you cannot “get things done,” then maybe it is time to cut your losses and expend your efforts elsewhere. Wednesday August 26th has Sun Conjunct Jupiter, an annual event, and is perfect for quick, possibly intense, short term projects that you plan to complete by the FM of August 29th. After that, “things” become different, with Sun Opposite Neptune on August 31st clearing away what the Full Moon does not. A square key on that date will also provide parting lessons about this period as we move into September and more fully into the school year. At the very latest, complete these projects prior to the eclipse of September 13th which is shortly followed by the Mercury Retrograde Station on September 17th. “Things” become more intense on August 27th, and by August 28th, both a hard rectangle is present and Sun Sesquiquadrate Uranus perfects. You can accomplish much at that time as long you make certain you do not lose your temper and do something inappropriate due to a rash decision. (Again, Europe and UK (and some people in the U.S.) will feel this on August 27th.) Even if you engage in a dispute, be focused and disciplined in your efforts; avoid impulsive decisions. This is a better day for follow through and “getting things done” before the Full Moon of August 29th perfects than it is for starting something new. And, if you run into a “wall” where you cannot “get things done,” then maybe it is time to cut your losses and expend your efforts elsewhere. We have posted a list of patterns for September 2015. Particularly important will be the period of September 16th through the 18th, centered on September 17th of 2015, a period bracketed by two eclipses, the first on September 13th and the second on September 27th (the “Blood Moon” eclipse), and that period includes Jupiter Opposite Neptune and the coming Mercury Retrograde Station. We particularly like this analysis of the Sun in Virgo by Alan Oken. We are working on a project on Long Term Forecasts. Frankly, we do not expect to complete this project in our lifetime. Your feedback, as we go, is appreciated. “Things” sometimes become rather busy for me from September until May, so I may start posting forecasts in clusters a bit ahead of when they are relevant. So, NM and FM forecasts as much as a month or six weeks in advance, the same for certain other aspects and patterns. Here is the posts page. The posts pages contains reblogs from a number of other astrology blogs as well as our own material. These reblogs are popular with most of our readers. 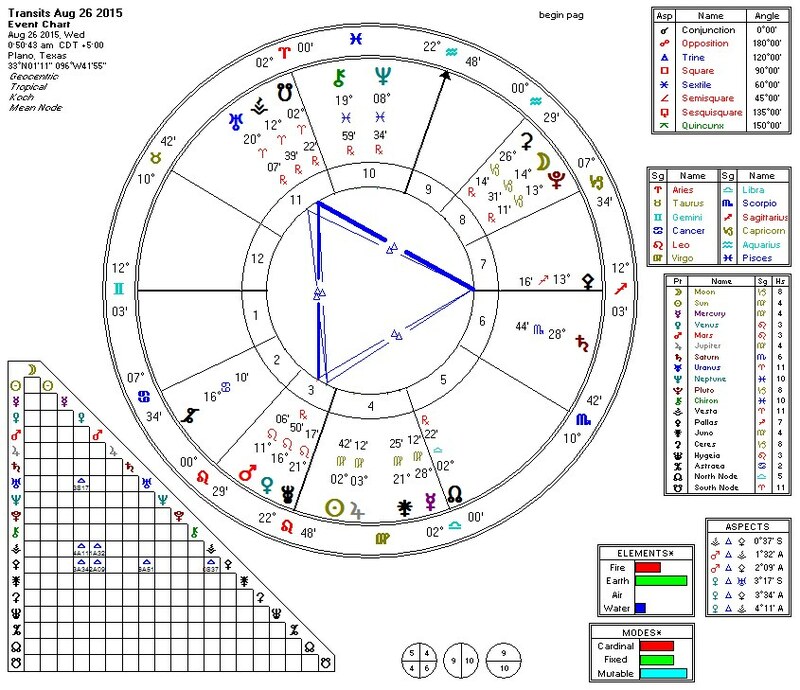 Below are our analyses of both recent and upcoming astrological patterns and events. The Hele Patterns of Tuesday August 25th tell us that we may need to form lasting alliances to “get things done” and move forward on the path to achieving our goals. You will want to make the phone calls and send the emails and text messages needed to align people to get things done by the Full Moon of August 29th. 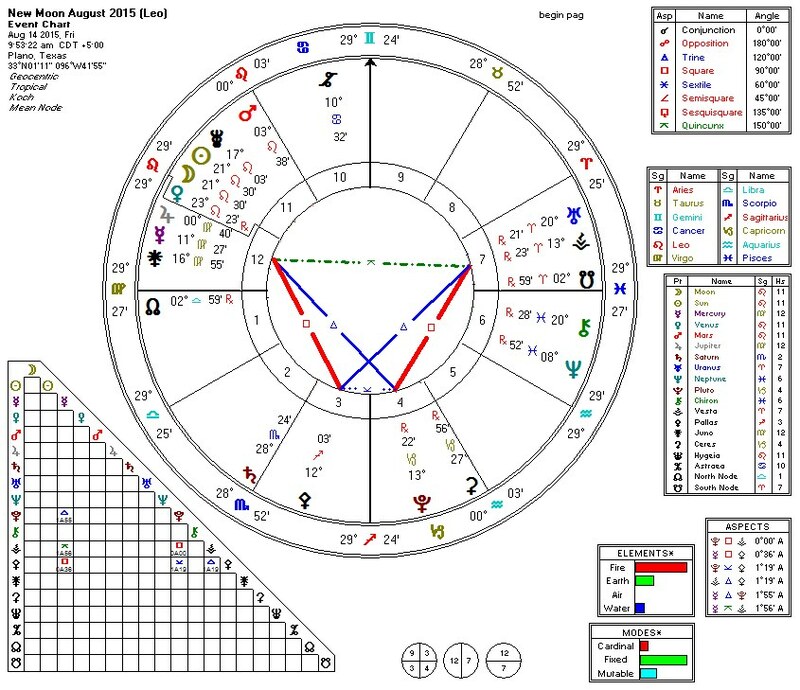 After that, “things” become different, with Sun Opposite Neptune on August 31st clearing away what the FM does not. A square key on that date will also provide parting lessons about this period as we move into September and more fully into the school year. Between now and the FM, we have a short window to accomplish a few key tasks. Wednesday August 26th has Sun Conjunct Jupiter, an annual event, and is perfect for quick, possibly intense, short term projects that you plan to complete by the FM of August 29th. At the very latest, complete these projects prior to the eclipse of September 13th which is shortly followed by the Mercury Retrograde Station on September 17th. Starting a WordPress Blog does not happen at a precise moment, so one can argue for the “birth” of this blog as late as 0059 CDT in Plano TX. We are using the chart for when we opened Solar Fire, just before we started the process of creating the blog. Here is the chart. This is a companion blog. It’s sole purpose is to create archives of the various daily forecasts posted on the “Front Page” (static page) of grandtrines.wordpress.com.